M T D D e c e m b e r 2 0 1 8 90 T P M S for up to 20 minutes continuously above 15 mph (24 km/h). e learning sequence initiates automatically when the vehicle has been stopped for more than 20 minutes. 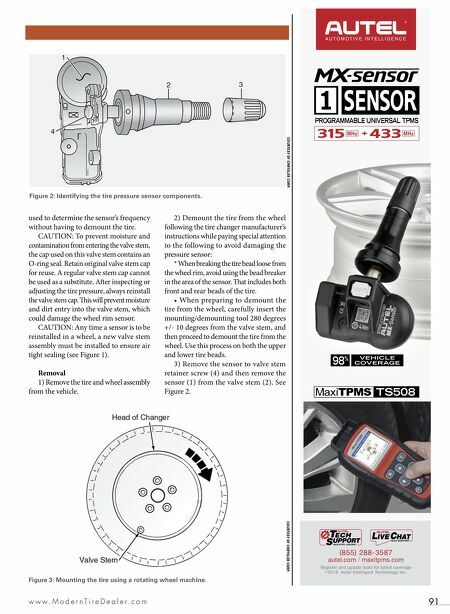 NOTE: A new sensor ID can also be programmed directly into the TPMS module by using a RKE-TPMS analyzer in conjunction with a scan tool. Once the new sensor ID has been programmed, the vehicle will need to be driven above 15 mph until the fault is no longer active (lamp extinguishes) and display is updated (for up to 20 minutes). Using a TPM-RKE analyzer can take up to a minute to force a transmission from a sensor. DEMOUNTING/MOUNTING PROCEDURES CAUTION: e tire should be demounted from the wheel using the tire changer manufacturer's instructions. Use the following information to avoid damage during the demounting/mounting procedures. CAUTION: e TPMS system has been optimized for the original equipment tires and wheels. TPMS system pressures have been established for the tire size equipped on the vehicle. Undesirable operation or sensor dam- age may result when using replacement equipment that is not of the same size, type, and/or style. Aermarket wheels can cause sensor damage. NOTE: If a tire pressure sensor has been replaced, see "TPMS reset procedures." NOTE: Wheels and tires are match- mounted at the factory. Before demounting a tire from its wheel, a reference mark should be placed on the tire at the valve stem location, to ensure that it is remounted in the original position on the wheel. For match-mounting procedures, refer to the appropriate manufacturer service information. TIRE PRESSURE SENSOR IMPORTANT: is vehicle uses the 433 MHz TPMS sensor. Although 315 MHz and 433 MHz sensors are identical in size and shape, they are not interchangeable. Always make sure the correct sensor is being used. A RKE-TPMS analyzer can be Torque specifications Component Ft.-lbs. (N.m) Wheel nut Steel wheels 63 (85) Aluminum wheels 75 (100) In.-lbs. (N.m) Tire pressure sensor nut 12 (1.4) D U R A B L E S P E C I A LT Y T I R E S D U R A B L E S P E C I A LT Y T I R E S DEESTONETIREUSA.COM CONTACT US AT 281-600-TIRE A Leader in Specialty Tires Deestone does it all... farm, tractor, implement, industrial, loader dozer, compactor, grader. 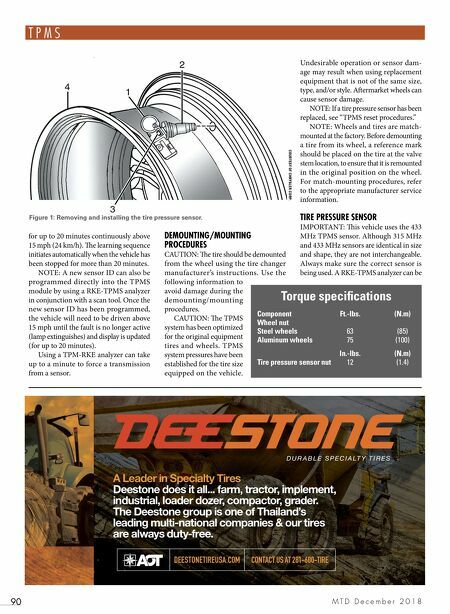 The Deestone group is one of Thailand's leading multi-national companies & our tires are always duty-free. Figure 1: Removing and installing the tire pressure sensor. COURTESY OF CHRYSLER CORP.